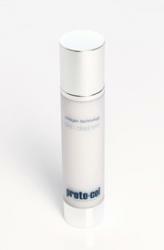 We are one of the first to supply proto col super strength collagen shot. This has been Scientifically proved that 5000mg of VERISOL® bioactive collagen peptide to visibly increase skin elasticity and reduce wrinkles. Skin elasticity also shows improvement. Together with skin firmness and tonicity. Healthier and skin looking younger is promoted. 10 day supply = 1 bottle per day. This remarkable collagen shot of advanced technology helps to deliver a special blend of VERISOL®, a collagen peptide, containing vitamins B6, C & E, Zinc, Biotin and Copper. This specially designed formula benefits both women and men, taken orally as a daily food supplement boosts your body’s own collagen reserves slowing down most visible ageing signs. This wonderful supplement has 5 extra ingredients to beat the signs of ageing.. Especially for the skin to maintain by pumping fine lines to minimise the wrinkles. With essential minerals and vitamins for better nails, skin and hair. The following Protocol wonderful skin range can be used in your daily skin care defence. Coral Seaweed – rich in amino acids and containing Calcium and Magnesium for healthy skin – intensely moisturises for super smooth skin. Plant derived Collagen nourishes and plumps fine lines and wrinkles while Orange Oil naturally cleanses and decongests skin. 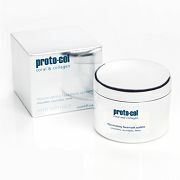 Neroli Oil helps boost cell regeneration and combined with soothing Camomile extract, helps to improve skin elasticity. Hydrating Palm Oil and soothing and healing Aloe Vera condition the skin while vitamin and mineral rich Guava and Kiwi help strengthen skin. Application – apply using a gentle circular motion over the entire face and neck then remove thoroughly with a dampened cotton wool pad. Coral Seaweed – rich in amino acids and containing Calcium and Magnesium to oxygenate and promote healthy skin – intensely moisturises for smooth, hydrated skin. Plant derived Collagen nourishes and plumps fine lines and wrinkles. Camomile – naturally rich in amino acids – protects the skin's natural moisture barrier function while soothing and healing Aloe Vera calms and conditions. Soothing Witch Hazel acts as a mild astringent and anti-inflammatory Panthenol gently soothes and heals skin. Extracts of vitamin and mineral rich Guava and Kiwi help strengthen skin and maintain optimum skin health. Application – apply after cleansing using a damp cotton wool pad. Benefits: Our unique patented ingredient – Hydra-Collasphere – blends our secret ingredient with collagen biospheres. This innovative light-diffusing ingredient optically reduces the appearance of lines and wrinkles dramatically. An independent clinical study revealed that the ingredients in Hydra-Collasphere reduce the appearance of ageing skin and give skin a matte finish and an instantly smoother appearance. Plant derived collagen works by boosting cellular activity and improving skin elasticity. 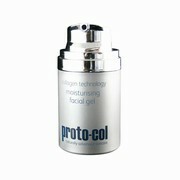 Its moisture-binding properties reduce fine lines and wrinkles and stimulate collagen formation. Hyaluronic Acid, known for its intense moisture boosting properties, fills the space between Collagen, elastin fibres and the cells, to plump fine lines and wrinkles and give skin a firmer, smoother appearance. Hydra-Collasphere and Collagen biospheres are suspended in Hyalauronic Acid. This unique formulation leaves a moisturising film over the skin and ensures an even skin tone and make up base. Soothing Aloe Vera instantly calms skin and is rich in the amino acids essential for healthy skin. Vitamin E protects against cell damaging free radicals, which potentially cause premature ageing. 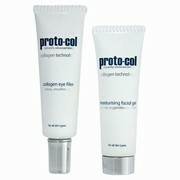 Application – gently apply a small amount of proto-col collagen eye filler around the delicate eye area until absorbed. Pay particular attention to fine lines. Pat and roll the finger for maximum absorption. Benefits: Moisturising facial gel benefits Fresh Royal Jelly is one of the most powerful natural antioxidants in the world containing B Vitamins as well as Vitamins A, C, D and E and over 20 amino acids. Plant derived Collagen nourishes skin and plumps fine lines and wrinkles while Coral Seaweed – rich in amino acids and containing Calcium and Magnesium – intensely moisturises for smooth, hydrated skin. Hydrolysed Silk – also rich in essential amino acids which are the building blocks of the protein in our skin – helps seal in skin's vital moisture. Vitamin D strengthens and protects against muscle weakness and Vitamin E protects against cell damaging free radicals. Essential in the war against wrinkles, Vitamin A thickens the epidermis, improves skin elasticity and stimulates the production of collagen. Vitamin C also boosts collagen production and promotes healthy skin cell renewal and repair. Application – using fingertips, gently smooth onto skin after cleansing and toning. Leave for one minute to allow the skin to absorb before applying make up. Benefits: Coral Seaweed – rich in amino acids and containing Calcium and Magnesium to oxygenate and promote healthy skin – intensely moisturises for smooth, hydrated skin. Plant derived Collagen nourishes and plumps fine lines and wrinkles while Jojoba Oil helps combat dry skin. The Diamonds and Pearls, crushed to fine particles, gently remove dead skin cells to reveal radiant, younger looking skin. Natural AHA's derived from Guava and other fruit acids assist in gently removing dead skin cells from surface skin while Grape extract acts as a mild astringent. Powerful antioxidant Ginko Biloba stimulates circulation to improve skin tone and combined with antioxidants Vitamin C and E, fights cell damaging free radicals. Hydrolysed Silk – naturally rich in vitamins and amino acids, which are the building blocks of protein in our skin, help to optimise the skin's moisture barrier function. Application – apply to thoroughly cleansed, dry skin. Using small amounts, spread a thin layer over the skin and work the product over the face in gentle circular movements. Spend one to two minutes gently working on each area of the face. Rinse with warm water and pat dry. 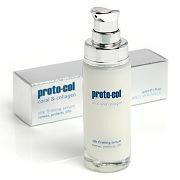 This unique plant-based facial moisturiser by Proto-Col is a fantastically light collagen and coral formula, and is a new concept in anti-ageing skin care. Fresh Royal Jelly is one of the most powerful natural antioxidants in the world containing B Vitamins as well as Vitamins A, C, D and E and over 20 amino acids. Plant derived Collagen nourishes skin and plumps fine lines and wrinkles while Coral Seaweed – rich in amino acids and containing Calcium and Magnesium – intensely moisturises for smooth, hydrated skin. Hydrolysed Silk – also rich in essential amino acids which are the building blocks of the protein in our skin – helps seal in skin's vital moisture. Vitamin D strengthens and protects against muscle weakness and Vitamin E protects against cell damaging free radicals. Essential in the war against wrinkles, Vitamin A thickens the epidermis, improves skin elasticity and stimulates the production of collagen. Vitamin C also boosts collagen production and promotes healthy skin cell renewal and repair. 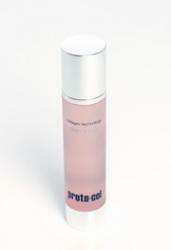 Proto-Col Silk Firming Serum is an exclusive plant-based collagen product which may firm the skin whilst improving uneven skin tone or discoloration. It contains hydrolysed silk protein which leaves the skin silky smooth to the touch and with regular use may also reduce pore size. Fresh Royal Jelly is one of the most powerful natural antioxidants in the world containing B Vitamins as well as Vitamins A, C, D and E and over 20 amino acids. Plant derived Collagen nourishes and plumps fine lines and wrinkles while Coral Seaweed – rich in amino acids and containing Calcium and Magnesium for healthy skin – intensely moisturises for smooth, hydrated skin. Kaoline cleanses, tones and refines skin and the essential oil of Geranium balances skin and improves tone and texture by stimulating circulation. Hydrolysed Silk – also rich in essential amino acids which are the building blocks of the protein in our skin – helps seal in skin's vital moisture. Quinoa extract, also rich in amino acids, promotes healthy skin and Azulene, known as a natural anti-inflammatory, calms skin. Antioxidant rich Sea Fennel firms skin and Papaya hydrates. Application – apply over entire face and décolleté in an upward motion. For maximum results, use twice daily after cleansing and toning the skin. Natural extract of Algae helps smooth fine lines and wrinkles while Coral Seaweed – rich in amino acids and containing Calcium and Magnesium for healthy skin – intensely moisturises for smooth, hydrated skin. Plant derived Collagen, which is made up of three types of plant Collagen, has been specially selected for its potent anti-ageing formulation. Neroli Oil and Magnesium stimulate skin cell regeneration and improve skin elasticity. Zinc, essential for the growth of healthy new cells, accelerates the healing process while cooling and soothing Aloe Vera helps heal skin. Powerful antioxidants Vitamins C and E protect the skin from UV damage and environmental pollution while skin softening Jojoba Oil hydrates. Application – apply to thoroughly cleansed skin. Start by applying along the cheekbone and smile line and smooth the mask thinly and evenly onto skin in an upward motion using the wide end of the spatula provided. The visible reduction of fine lines and wrinkles is evident after use. 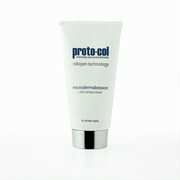 Proto-Col's Rejuvenating Face Mask is a progressive treatment. Apply to a thoroughly cleansed face. In the blending pot provided, and using the narrow end of the spatula, blend 2/3ml (approx half a teaspoon) of Collagen Face Mask cream with the contents of x 1 to 1.5 pure collagen capsules (these are opened by gently pulling the two ends of the capsule apart). From the facial contour, follow the cheekbone and smile line. Fan the mask out in an upward direction, using the circular end of the spatula. Apply thinly, smoothly and evenly. Eye area: Gently apply around the eye area. Begin at the outer corner of each eye, ensuring that you do not drag this delicate tissue. If the tissue is extremely lined the mask should be applied by gently patting on with fingertip. Forehead: Apply above the brow-line to the hairline, paying close attention to any frown lines between the eyebrows.